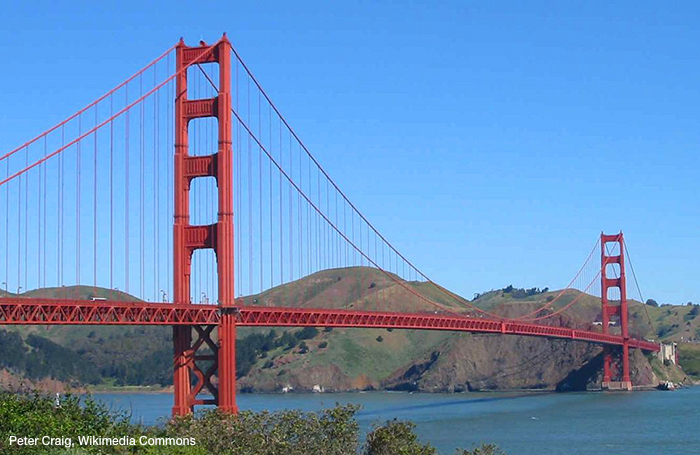 Opened in 1937, the Golden Gate Bridge links the headlands of the San Francisco and Marin peninsulas and is perhaps most famous landmark of San Francisco. The single-suspension span is anchored by two towers reaching a height of 746 feet (227 meters) and was once taller than any of the city's buildings. Two cables, each 7,650 feet (2,332 meters) long, support the suspended roadway. Together, they contain 80,000 miles (129,000 kilometers) of galvanized steel wire. 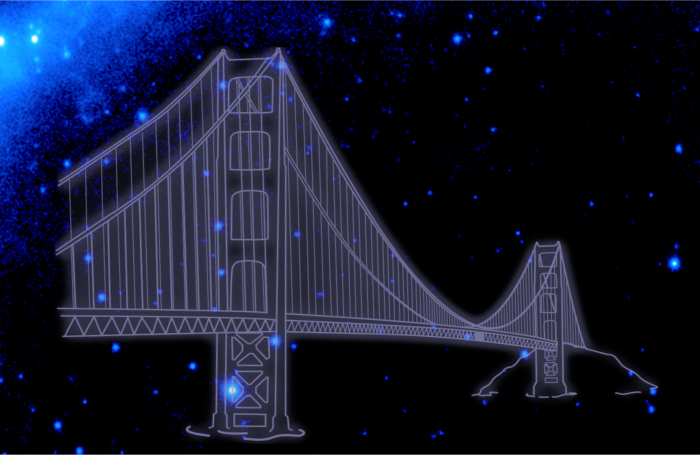 This constellation symbolizes the important contributions of California scientists to the Fermi mission. The SLAC National Accelerator Laboratory, operated by Stanford University, managed the development of Fermi's Large Area Telescope (LAT), made important contributions to all the electronics critical to measuring the properties of gamma rays, and integrated the instrument from hardware fabricated at facilities around the world. SLAC also runs the Instrument Science Operations Center, which processes LAT data. The University of California, Santa Cruz, team led the development of low-power electronics and the particle tracker that forms the heart of the LAT. Through the detection of gamma rays, Fermi provides scientists with a tool to explore the importance of several different mechanisms for accelerating subatomic particles to near the speed of light. One place where this occurs is in shock waves produced by a variety of astrophysical phenomena, including jets powered by monster black holes, gamma-ray bursts, supernova remnants and more. Whenever randomly wandering particles cross a shock wave, they gain a small amount of the shock's energy and move a little faster. Particles that happen to do this many, many times become accelerated to extremely high energies, reaching speeds comparable to the speed of light. Particles can be accelerated in other ways, too. In pulsars, large electric fields can accelerate electrons, protons and nuclei in much the same way that terrestrial particle accelerators, such SLAC's, ramp up particle speeds. But pulsars can accelerate electrons to energies hundreds of times greater than the SLAC accelerator. Another mechanism for particle acceleration is known as magnetic reconnection. Whenever powerful magnetic fields become entangled, they may undergo an abrupt reconfiguration to a lower-energy state. This releases a vast amount of energy into surrounding particles. Magnetic reconnection occurs when the Sun produces solar flares, and it may also be at work in active galaxies and supernova remnants. 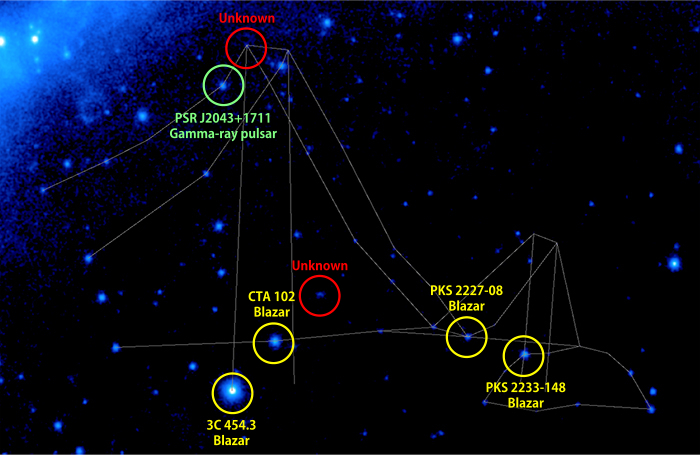 Regardless of how they became accelerated, high-energy protons, electrons, and nuclei can escape into interstellar and even intergalactic space, where they become cosmic rays, or they can interact with magnetic fields, gas, or starlight to produce gamma rays observed by Fermi.